1. Heat oven to 300°F/150°C. Rinse pig’s head and thoroughly dry it with paper towel. Set it, cut side down, in a roasting pan. Rub a teaspoon of the salt into skin. Tuck shallots, garlic, and bouquet garni around head and sprinkle with pepper and remaining salt. Pour over wine, brandy and water, adding enough water to half cover head – the cheek should remain above water so it steams. Wrap a piece of foil tightly around the ear. Cover pan with foil. 2. Bring the liquid to a boil on the stove top, then transfer pan to the oven. Slow roast pig’s head in the oven until it is partially cooked, about 2 hours. Remove foil, leaving ear covered. Continue roasting until most of water has evaporated, pig skin is a deep mahogany color, and meat is almost falling from bones when poked with a fork, about 4 hours longer. If ear is still soft, discard the foil 20 minutes before the end of cooking. 3. Let pig’s head rest, loosely covered with foil, at least 15 minutes before serving. While waiting, strain juices into a small saucepan, discarding bouquet garni and vegetables. If necessary boil juices on top of the stove to a concentrated gravy. Skim fat and whisk in Dijon mustard. Taste gravy for seasoning. 4. 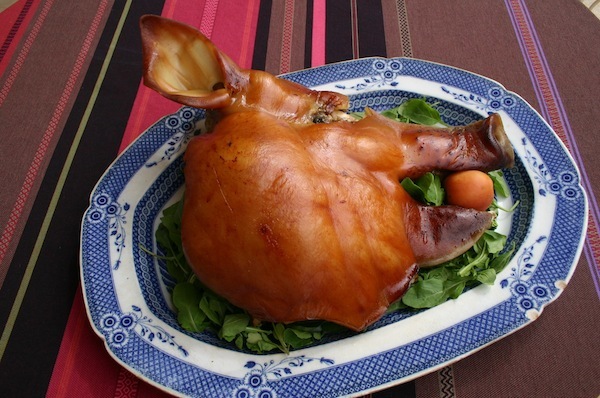 Rest the pig’s head on a bed of greens on a warm platter. To serve, cut off the ear and set it aside. With the help of a sharp knife and a large spoon, lift off the crisp skin in one piece. Cut the skin, including the ear, into approachable pieces using a heavy knife or cleaver. Scoop meat off the bones with the spoon. I hope it all turned out well. It is delicious!! I always simmer mine for 2:30 hours adding onions and herbs, salt and pepper. You can deep fry the ears and fry the skin as well. You then have the cheek, tongue and the brain to enjoy. Never put horrible mustard near me. The stock – reduced – is most useful. Ex restaurature. Fantastic recipe bookmarked as favourite thank you for generously sharing this wonderful recipe!!! I made this dish exactly as stated a few weeks ago, and it turned out perfect. I made it again last night with the other 1/2 of the head. I made one change though. Iightly brushed the skin side with liquid smoke and added 4-5 drops to the liquid. The beautiful smokiness was delightful. 1st Time cooking came out DELICIOUS!! I had a 22 pound pigs head. Had to cook it for 8 hours instead of 6. Tasted delicious but it had very little meat. Almost all fat. I had 11 people sitting st the family table to celebrate my sons 42nd birthday. How can I ensure the next pigs head has meat on it instead of all fat? Thank you for your comment. I can recommend that you speak to your butcher and he/she will be able to assist you. How do you get the pigs head ready to cook? I heard you have to take the eyes & brains out & cut off ears? Yes please make sure the pigs head is thoroughly cleaned.